On Sunday, Johan Franzen joined the injury parade as he took a hit from Tampa Bay defenseman Radko Gudas and now he's also on concussion protocol, according to general manager Ken Holland. DETROIT — Desperate times call for desperate measures so the Red Wings had better figure out what those measures might be. The injuries are mounting and so are the losses for a team that expects to make the playoffs for a 23rd straight season. The Red Wings just can't seem to avoid the injury bug. On Sunday, it was a tired Tampa Bay Lightning team that was shut out in New Jersey by Martin Brodeur Saturday that found enough life to hand the Wings a 3-0 loss, their fifth straight. Petr Mrazek started in goal for the Wings because Jonas Gustavsson had started four of the last five, including Saturday’s 4-1 loss to the Pittsburgh Penguins. For a while, it looked like Mrazek might get a shutout, robbing Richard Panik near the end of the first period and remaining steady whenever the Lightning were on the attack. But the shutout ended early in the third when Ondrej Palat stole the puck from Tomas Tatar, Martin St. Louis fanned on the shot and Tyler Johnson was there to put the puck in the right side of the net at 3:13. "I think the second period I played really well, and we just couldn’t score a goal," Mrazek said. "They scored first and that was the most important (thing) in the game." The Wings have scored a total of five goals in their last five games. Well, technically, the Wings did score at 2:02 of the first period but an early whistle meant no goal for Gustav Nyquist and no goal for the Wings. "I thought we had some good looks tonight, we didn’t score," Wings coach Mike Babcock said. "For whatever reason we’re not scoring. Pav(el Datsyuk) rung one off the post. We had the one goal there (that was disallowed), and we had some good looks but we didnât score. We got to stick with it. "Obviously we’re more challenged offensively just with our lineup. But there’s no sense whining or feeling sorry for ourselves, we got to find a way to win a game." It’s just getting more and more difficult to do that as the Wings keep losing players. Henrik Zetterberg has missed seven games because of a herniated disc, Darren Helm has missed six with a shoulder injury, Stephen Weiss has missed three with a groin injury, Danny DeKeyser has missed 13 with a shoulder injury and Jimmy Howard has missed three with a knee injury. Zetterberg, Helm and Weiss being out obviously affects the offense but so does DeKeyser, whose ability to move the puck quickly often leads to opportunities on offense. Then Saturday the Wings lost Justin Abdelkader to a concussion, which means he can’t return until he passes the league protocol. On Sunday, Johan Franzen joined the injury parade as he took a hit from Tampa Bay defenseman Radko Gudas and now he’s also on concussion protocol, according to general manager Ken Holland. "It’s all those guys who get bumped in the head. It’s like in the league now they’re gone forever, it seems like," Babcock said. "I don’t know what that means. I don’t know protocol-wise what will happen." The Wings called up Tomas Jurco to replace Abdelkader and he played with Datsyuk and Daniel Alfredsson, recording one shot on goal. "When I first find out I’m coming here I have no idea that I’m going to start with Pav and Alfie," Jurco said. "I just found out before the game and it was a great feeling. I think we played pretty well. We didn’t score but we had some chances. It’s an unbelievable experience for me." Now they’ll need to recall a center as they’re down to Datsyuk and Joakim Andersson as their only centers. "It’s another opportunity for someone to grab more ice time and do well and really take advantage of it," Niklas Kronwall said. "We can’t feel sorry for ourselves. Every team goes through this. "Just gotta stay positive and stick together as a team. In the long run, I think you’re just going to benefit from it." But the Wings don’t have time to wait for the long run. They have to start getting some points now, particularly at home where they have a dismal 5-8-6 record. "Enough talking. 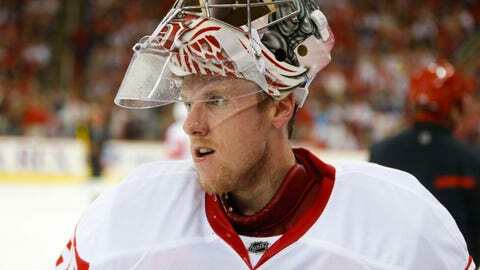 We have to find a way to get the job done out there," Kronwall said. "We can’t just come in here and say the same things over and over again. It just makes you look silly. So we have to find a way to show it on the ice."